Caleb John #25 and Chris Skyers #13 of the Army Black Knights celebrate after Army defeats Navy Midshipmen 17-10 at Lincoln Financial Field on December 08, 2018 in Philadelphia, Pennsylvania. President Donald Trump attended the 119th game between the rivals and flipped the coin before spending a half on each side in a show of impartiality. 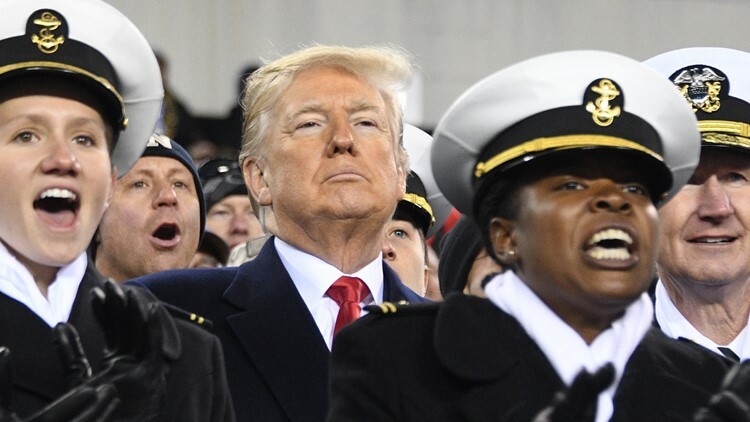 US President Donald Trump attends the annual Army-Navy football game at Lincoln Financial Field in Philadelphia, Pennsylvania, December 8, 2018.